The Kansas City Chiefs have a couple things going for them, despite their abysmal win-loss record: Jamaal Charles and an affinity for playing at Oakland-Alameda County Coliseum. In reference to Charles, he is quickly making Chiefs fans think, “Larry WHO?” Meanwhile, the Chiefs have had their fair share of success at the Coliseum as they have the longest winning streak of any Oakland Raiders opponent. Sunday pitted these two opponents; and as has been the case, not much offense to speak of – especially on the Oakland side. That didn’t change very much as Charles ran for 103 yards and a touchdown, leading Kansas City to a 16-10 win over Oakland. The Raiders scored on their opening series, capped by a 1-yard TD run by Justin Fargas with 12:42 left in the quarter, giving Oakland a quick 7-0 lead; nearly 8 minutes later, Chiefs kicker Ryan Succop converted a 50-yard field goal, narrowing the Riders’ lead to 7-3. Sebastian Janikowski booted a 50-yarder of his own, padding Oakland’s edge to seven at 10-3; the Chiefs would take over the second quarter as Charles rushed for a 44-yard TD run along with a Succop 25-yard FG, increasing Kansas City’s lead to 13-10. 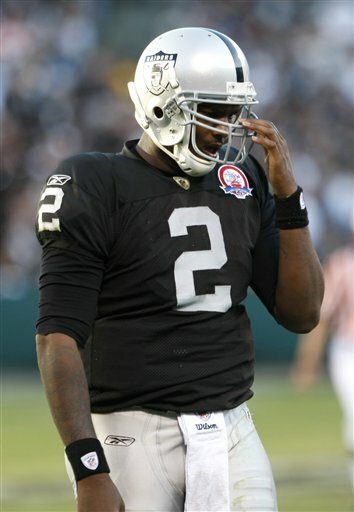 For the second game in a row, the Raiders replaced JaMarcus Russell during a game with Bruce Gradkowski due to inefficiency; the move didn’t improve things much for Oakland. During the fourth quarter, Succop converted a 31-yard FG with 6:17 left in the game, giving the Chiefs nenough to hold on for the victory. Cassel went 19-of-34 for 216 yards and an interception while Russell was his usual ineffective self, going 9-of-24 for 67 yards; Gradkowski wasn’t any better as he went 4-of-8 for 46 yards and 2 INT’s. Charles led the Chiefs as he rushed for 103 yards and a score; Michael Bush led the Raiders rushing attack with 119 yards while Fargas rushed for 41 yards and a TD. Dwayne Bowe led all Chiefs receivers with 6 receptions for 91 yards while former San Diego Charger wideout Chris Chambers caught 3 balls for 60 yards; Johnnie Lee Higgins led the Raiders receivers with 4 receptions for 41 yards while Chaz Schilens caught 3 passes for 27 yards. Kansas City (2-7) returns home to Arrowhead Stadium when they host the Pittsburgh Steelers Sunday while Oakland (2-7) stays home to host the Cincinnati Bengals – also on Sunday afternoon.